Although it's not officially summer until June 21st, I think we can all agree that - summer is basically here right? I don't mean to totally skip over Spring or anything, but when you live in Miami, Spring and Summer are basically one. Plus, you know what else screams summer? Memorial Day weekend and barbecues and picnics and cookouts! All of which I hope you get to do tons of in the next upcoming weeks and months! So to make things easier for you lovely vegan souls, I went ahead and gathered 18 totally awesome Summer-y recipes that are not only perfecttt for this Memorial Day Weekend, but also amazing for the rest of summer as well. Like always - a big big thanks to all of the amazing bloggers all over the internet that helped this round up come together. If you like what you see - please don't forget to SHARE the love by hitting on of the social media sharing buttons. 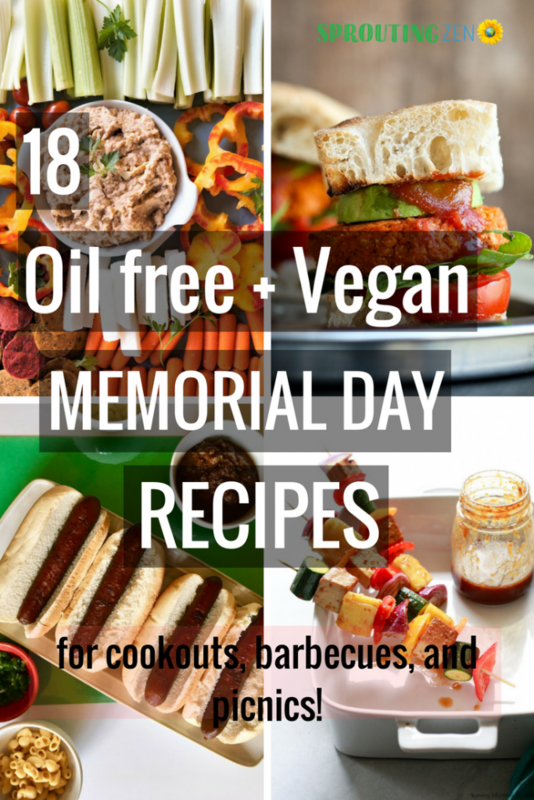 18 oil free vegan recipes for memorial day weekend and summer cookouts! Seriously you guys. If you want to have the best Memorial Day weekend / Summer Cook Out party. Your menu NEEDS this. Yummy vegetable kabobs that are so fresh and colorful! So much goodness in one bite! Delicious AND healthy sweet potato chickpea burgers. The prettiest salad ever topped with a creamy cilantro sauce. This has summer and Memorial day weekend cookout written all over it. Keep it fresh this Memorial Day weekend with these raw vegan romaine lettuce boat tacos. Topped with sundried tomato walnut meat, pico de gallo and guac, these are sure to stun at your next big cook out or picnic! Every good Memorial Day Weekend Barbecue / Cookout needs a tasty healthy vegan hot sauce. This one's it. These are so incredibly creative they HAVE to be on your Memorial Day weekend menu. Yummy veggie stacks made with sweet potatoes, cucumber and tomatoes. Note: the recipe does call for white yogurt, make sure you use a vegan yogurt, or leave it out completely. It also calls for a bit of oil to roast the sweet potatoes, but for a completely oil free version you can coat the potatoes in veg broth instead. Make this artichoke bean dip and serve it with a colorful platter filled with veggies and crackers! Perfect Memorial Day weekend snack! Don't panic! These ARE cruelty free - promise! Even though they look so much like the real thing, these bad-boys are made with CARROTS! Say what?! Stun the crowd this Memorial Day weekend with these faux hot dogs. Note: These do call for sauteeing in coconut oil, but for a completely oil free version use veg broth instead! With some amazing tips that Caitlin brought back from her recent trip to Israel, she promises this to be the best hummus recipe we've ever tried. From the looks of it, it sure does look creamy and sooo delicious. Wow your guests this Memorial Day weekend with an authentic hummus dip recipe they'll never forget. These are not just regular kabobs - these are stuffed with tasty falafel! Honestly, don't knock it 'till you try it. This totally unique grilled tofu recipe is sure to wow the crowd, vegan or not. This one's got two oil free recipes in this one post! Learn how to make PB and Chocolate Banana boats and Grilled Watermelon On a Stick. A super easy tomatillo salsa that you can make in 15 minutes and serve it on top of your favorite Memorial Day weekend meals! It's all about the flavors in this Italian-Inspired Cheezy burger recipe! A delicious and nutritious Cuban staple that can be served as is or as a side dish with rice. A delicious almond based vegan feta cheese that can be sliced or cubed. The herb marinade does call for oil, but you can still enjoy the feta cheese without it! How cute are these?! The vegan cheese does call for a tiny bit of oil but sub it with some veg broth for a completely oil free version! 18 oil free vegan and healthy recipes for Memorial Day weekend, and the rest of summer. Tell me do you have special plans for this Memorial Day weekend?! Want to see more round ups? Check out 25 Awesome And Simple Juice Recipes or 30 Raw Vegan Dessert Recipes. Always oil free, always vegan! Did you make anything from this round up? This is a fantastic line-up! I want to serve everything. Thanks for all the great recipes. Pinning! Oh my goodness, I am so glad that summer has arrived! What a lovely showcase of culinary summer delights. I want to make all of them right away. Thank you for including my feta.